I’ve designed more than a few bikes for riders of all types over the years and up until a few years ago I was never once asked what the head tube length of the bike would be. I’m not sure exactly what changed but now head tube length seems to be a metric that some want to use to help determine fit and to give an impression of how much saddle to bar drop the bike will have. I see this with new designs I submit to clients as well as riders considering buying a second hand bike off the webbernet – they all now ask what the head tube length is in hopes that they can know how much bar drop the bike will give them as if a head tube length of X will give a bar drop of Y. But can head tube length be used to determine bar drop – in a word…No. I suppose if one is looking at a plus/minus tolerance of 15-20 mm of bar drop then it might be OK but very few discriminating riders will be happy with such a wide spread. It’s more than understandable that the rider would like a simple number that they could look at and know if it will work for them. Who wouldn’t like to know that any bike with a top tube of X and a head tube between Y and Z would work well for them? That would rock. But unfortunately it doesn’t work out very well and all too many riders get lead astray by a head tube length that they think will work for them only to discover that head tube length isn’t a great way to accurately determine bar drop. 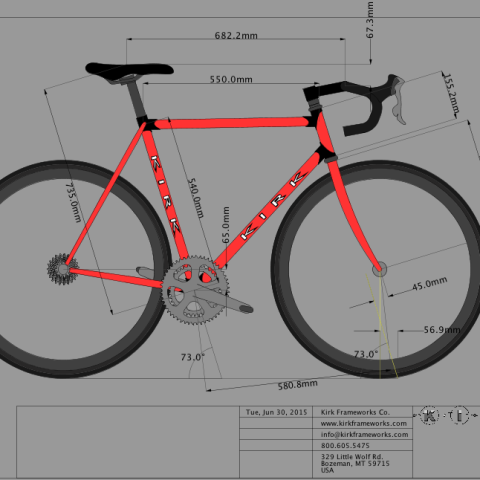 Take a look at the two BikeCad designs I’ve included. Both bikes have an identical fit right down to the 1/10th of a millimeter. Now look at the head tube lengths – you’ll see one is a full 23 mm shorter than the other yet they have identical bar drop numbers. The two bikes have the same saddle heights, seat tube lengths, top tube lengths, stem lengths/angles and spacer counts…everything is the same. Yet the bar drops vary by 23 mm which for most riders would be WAY outside the “it will be fine” range. Why is this? Take a look at two numbers I’ve also included – BB drop and fork length. One bike has a BB drop of 80 mm and a fork length of 373 mm and this would be pretty common for a sport touring type bike built to use a wider tire and a long reach caliper brake. The head tube length of this bike is 132.5 mm and the bar drop is 67.3 mm. Now look at the other bike – it has a BB drop of 65 and a fork length of 366. This would be a very common set up for a race bike that would use smaller tire and a short reach brake. This bike has a head tube length of 155.2 mm and an identical bar drop of 67.3 mm. It would be tempting to ask the head tube lengths and upon hearing them think that the one bike would have 20+ mm more bar drop than the other. But this of course would be wrong, as they of course are the same. The problem is that head tube length can’t be looked at in isolation and rather than being a number that the designer set out to achieve from the outset (like cockpit length for instance) it’s a resultant of the other numbers used in the design…it’s a mere by product when it comes down to it and nothing more. Since things like BB drop and fork length/rake, head angle are far from standardized we will almost always be comparing apples-to-oranges when we compared two bikes with different head tube lengths. I chose to keep things simple here and just have two examples with only two variables changed but if I played with the numbers some more (like head angle, fork rake, headset style or using a fork length common to cross bikes) I could have easily come up with an even larger difference in two head tube lengths while having the same saddle to bar drop numbers. So if you are still with me I assume you can now see what doesn’t work to estimate saddle to bar drop and I can hear you asking, “what is the better way?” That’s the tough part – there is no simple foolproof way to look at a given frame design in isolation and determine the bar drop you will have with your saddle height and stem length. If you are starting from scratch and having a frame built just for you then of course ask the builder how much bar drop there will be the stem and spacers designed in from the beginning and forget all about the head tube length as it means little to nothing. If on the other hand you are looking at buying a bike that wasn’t built for you personally (massed produced or second hand custom) then estimating bar drop can be much tougher. If you have ALL the frameset numbers then you might find an online calculator that you can use where you can plug in your saddle height and stem length and see what you get. But there is no easy way with this one I’m sorry to say. So make sure to do your homework…and of course toss the idea that head tube length is a meaningful number as it pertains to saddle to bar drop. This entry was posted in Bike, Musings, Process.